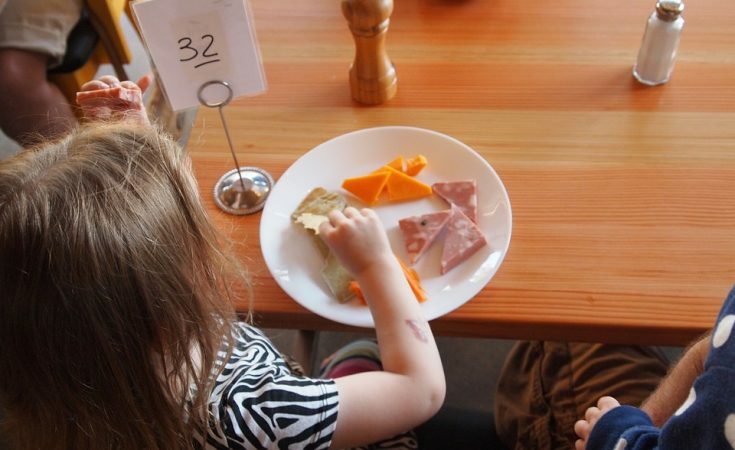 In the days before children, going to a restaurant was a leisure activity; something relaxing and enjoyable. It was an excuse to get dressed up and probably have a bottle (or two) of wine whilst putting the world to rights and, crucially, meant no cooking or washing up. Eating out now is an entirely different experience with a whole new meaning. It is never done in the evenings; that would be pure madness. It is not done for pleasure, usually, but necessity. Children need to eat fairly regularly or they can swiftly become extremely unpleasant; so if you head out and about with children in tow, unless you’re the always-prepared packed-lunch type, at some point you’re going to have to find something to eat. If we are out and it reaches midday, we must immediately stop what we are doing and find a suitable eating establishment. Being engrossed in something and failing to note the time is a terrible, terrible mistake. There is an approximate window of seven minutes between my toddler announcing she is hungry and all hell breaking loose. The baby gives no such warning. The choice is somewhat restricted, and generally we have to settle for the first place that is already open, has seats and high chairs free and is ‘child friendly’. Without exception these are the places we would have actively avoided before becoming parents. I’m talking mainly chains with no atmosphere, predictable menus and OK food. Oh, and lots of other people’s children. However well planned the trip and whatever time we arrive, the whinging usually starts about 5 seconds before the waiter arrives with the menu and informs us that there is a bit of a wait because they are busy, because apparently it is entirely unpredictable that people may wish to eat at lunch time. Often at these family friendly chain-restaurants, there are crayons for the kids and menus to draw on, which is all well and good if we have caught the hunger in its early stages. If we are past that point, this is not acceptably distracting for the toddler. The only solution we have found to this (bar plying her with snacks which mean she won’t touch her food) is to hand over a phone and let her play games or watch You Tube videos. Feel free to go ahead and judge me, it can’t be as harshly as I have judged myself. My children may be small, but properly motivated they can put away a ridiculous amount of food. There’s always a comment from a well meaning old dear, always, about how well they both eat. Smug although I may feel now, along with sleeping it’s not really a desirable trait once one reaches adulthood. Alas. 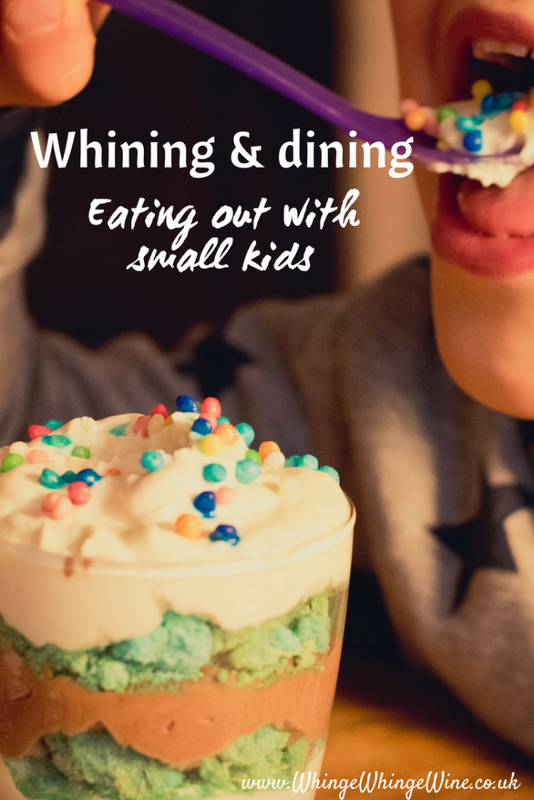 In a futile attempt to fill the gaping void that is their empty stomachs and restore the calm, we end up ordering a fairly expensive child-sized meal for each of them which is usually advertised as suitable for a child up to ten years old. Generally it will involve chips; I have not yet met a child that doesn’t covet chips. There is zero point trying to get vegetables into them in these places; at home I have a million tricks to get them to eat their veg (well, one: hiding it) but when eating out, baked beans are king. Peas at a push. There will probably also be some kind of pudding (usually ice cream) which I will eat most of. To help out, you understand. It’s for the greater good. Inevitably, when the food arrives, it will be hotter than the sun. This is bound to anger the hungry whingelets. Waiting for food which is right in front of their eyes is not something my children can do quietly. Don’t you dunk your chips in your ice cream? As mentioned previously, the upside of eating out is supposed to be less tidying up. Of course, this isn’t actually the case when dining with small children. They insist on feeding themselves, however the baby in particular is not quite au fait with the skill of actually getting food in his mouth (as opposed to his hair or eyeballs) just yet, so inevitably a fairly large proportion will end up on the floor. Whether it’s because I’m a decent person or just easily ashamed, I do attempt to tidy this to the best of my ability which usually involves a large amount of baby wipes and crawling around on the floor and wiping down seats and surfaces, although I am always sure to smile sweetly and leave a hefty tip anyway. All in all, I can think of better ways to spend an hour and thirty odd quid. I should probably brush up on my packed-lunch making skills. It always seems like such a good idea at the time! Ah, true! If I eat at home my food gets stolen and/or cold. Baby is also 11 months but it doesn't get better 😉 My kids are ruled by their stomachs! Ah, I remember when eating out used to be fun. Now we have to worry about the Popple throwing her food on the floor, or eating too quickly so she's pissed off before our food has even arrived, or what to do if we forget a bib (which happens A LOT). Even chips? Every kid loves chips right?? Hahaha a little but I don't blame you. Non-parent type people always think meeting for lunch will be fun! What fools. They soon learn. Eating out with children can be interesting, to say the least. 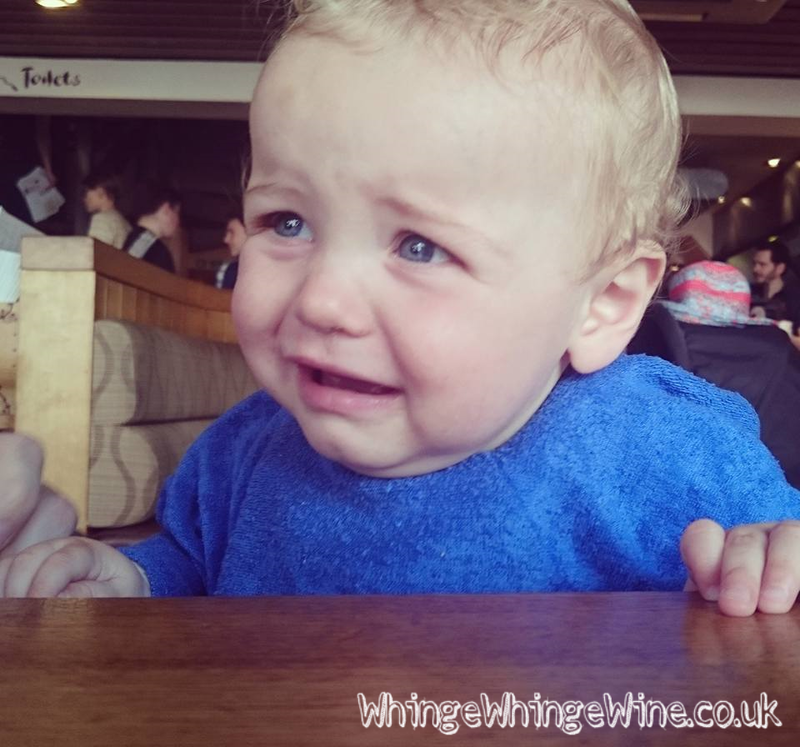 I remember taking my 20 month old son to an old fashioned styled restaurant and he was a holy terror. This was 13 years ago and it is still burned into my mind. lol #KCACOLS it gets better! The baby looks so cute while eating. So lovely! Ah eting out with kids!! When the teens are away with gparents the 8 year old and I 'treat' ourselves to lunch out. She is still unfamiliar with the concept of waiting for them to cook your food..and thanks to a food channel obsession will generally go all Gordon Ramsey about the meal she gets anyway…Really don't know why we do it!! Yup. And why is it that they always seem to bring out the kids' meals last, after everyone else's? Garrr! We seem to do this a lot, and often it's not an enjoyable experience. 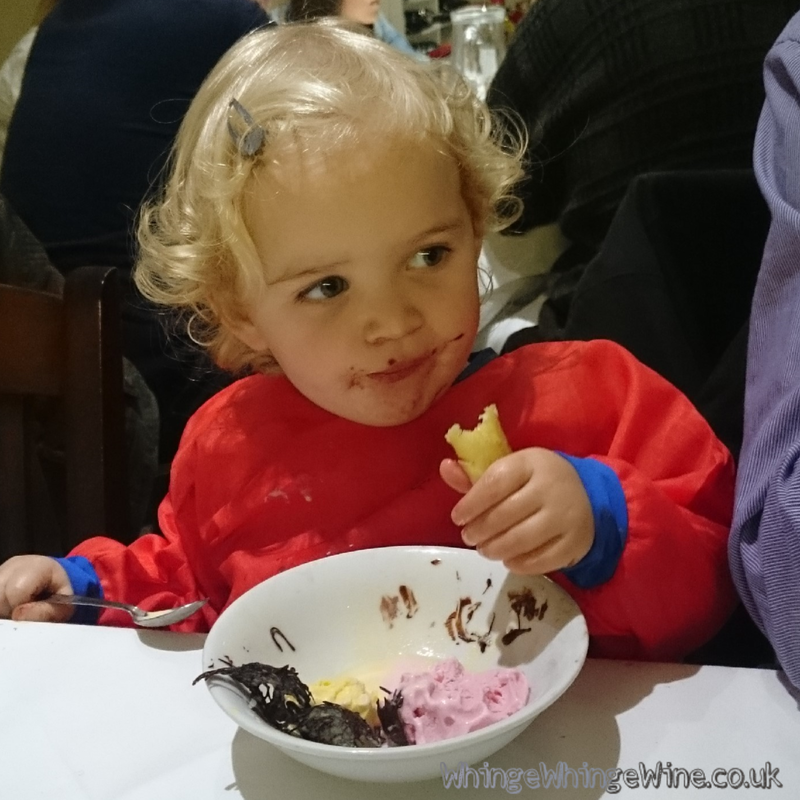 My biggest bug bear, why do these family friendly chains serve kid sized meals with ginormous cutlery to eat it with? It's just not the same is it?? I think we've been out to eat by ourselves a total of twice in two and a half years! Oh gosh yes. Why would you give a toddler a glass?? Madness! That's very true. Can't expect them to learn with no experience! Just requires an extra level or organisation I'm not convinced I'll ever reach! Oh god that sounds terrible, highchairs are a must! My daughter is just about ok now without one but the baby would be a nightmare! I wish grandma lived closer so she could! Ah well that is something I can't do as both of mine are now weaned. Iphone it is then! I know! Get plastic spoons for goodness sake. I tend to carry around plastic cutlery with me now! Less opportunity to stab. 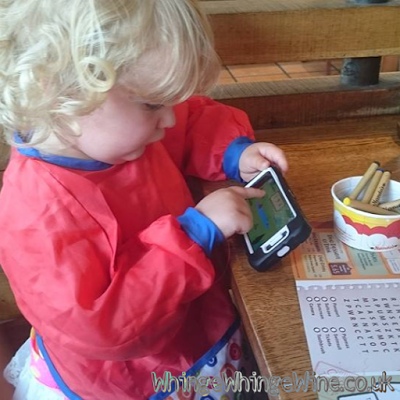 The oldest one can be trusted out of a high chair now, just about. The younger one obviously can't. I can't wait for the day that they will be able to understand the concept of waiting although I'm not actually that good at it myself to be honest. Well that is indeed peculiar! No chips eh… I wouldn't know what to feed mine! We did this with a small sleeping baby. We did not stay for dessert. That is very inconvenient – how else do you bribe?? We don't have any with toys – that would be perfect. Leave me to my chips and ice cream and go play, please. I'm glad it resonates… although I'm sorry! Thank you – Only takes a decade eh? Pre warned is pre armed! Carry food everywhere forever. Thanks Abby from the Pressure Cooking Portal you cheeky thing. I won't even delete the comment because dammit my children ARE cute. That's always a pro to a bad experience – good blog material! That sounds like a fab invention! I had to actually think about that for a moment – sounded posh 😉 I have yet to try it! One good thing about teenagers maybe?! Yes my two are very good at eating when their food actually arrives (usually) – it's the lead up to it which is unbearable! I am really impressed that your children eat well. Enjoy it. It is such a relief. Cygnet is a really fussy eater. We occasionally eat out because it is fun. I often find that I am wasting my money though when Cygnet only eats the chips.